Chairs are wonderful things. Especially the kind that welcome you into them with soft comfort and firm support. The kind you want to curl up in with a good book and a cup of coffee and relax for a while. 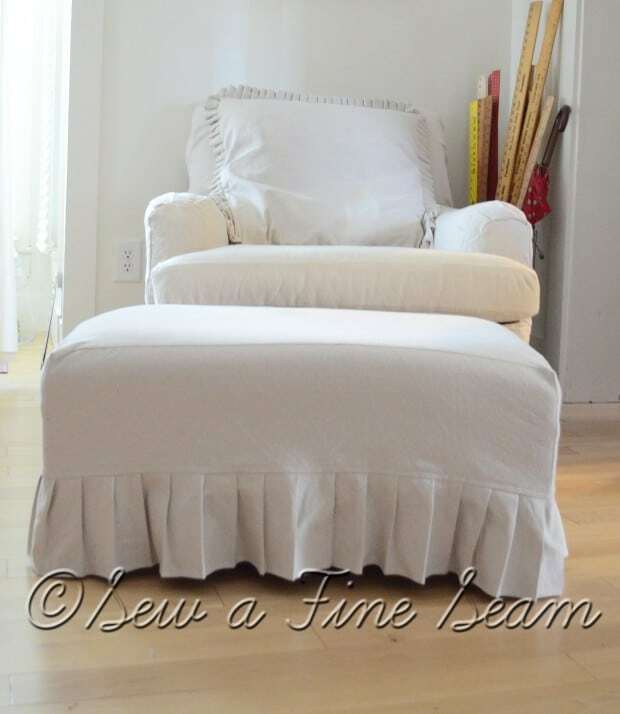 Covered in Linen and constructed in a wonderfully sturdy, comfortable way this chair began it’s life in glorious form. But as years went by it began to look tired and to show the stains of the much-loved life of a wonderful chair. But really all it needed was some re-dressing. 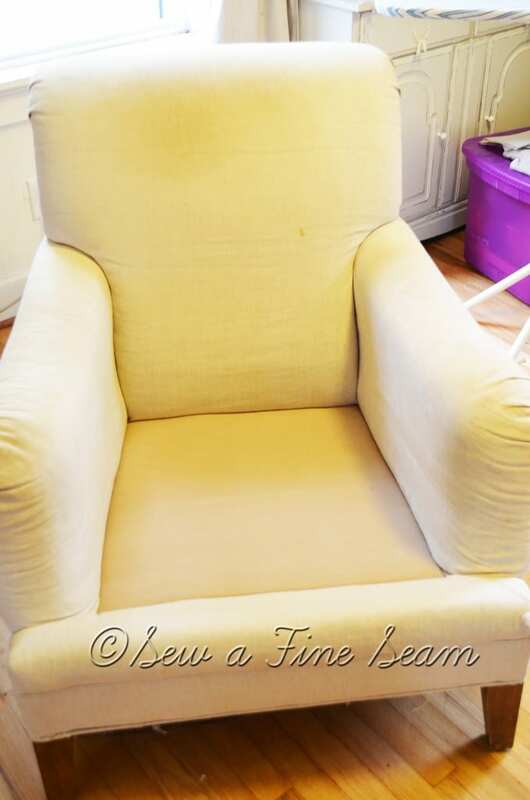 This chair is now wearing a drop cloth slip cover and no longer looks tired. It is very happy to have its life extended with the simple addition of a new ‘dress’. The pillow that goes with this chair was thrilled with the pleated ruffle accent added to its edges. The ottoman that matched the chair also received a pleated ruffle addition. The front of the chair got the same treatment too. 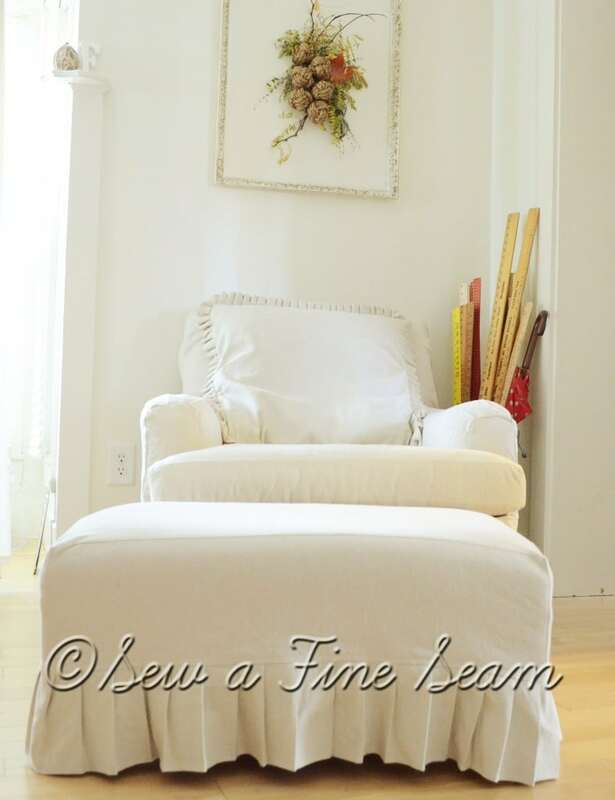 Chair, Pillow, and Ottoman are quite proud to match in this way. I decided the design of the chair did not need the pleated ruffle on the sides so it only wraps around a little on each side. 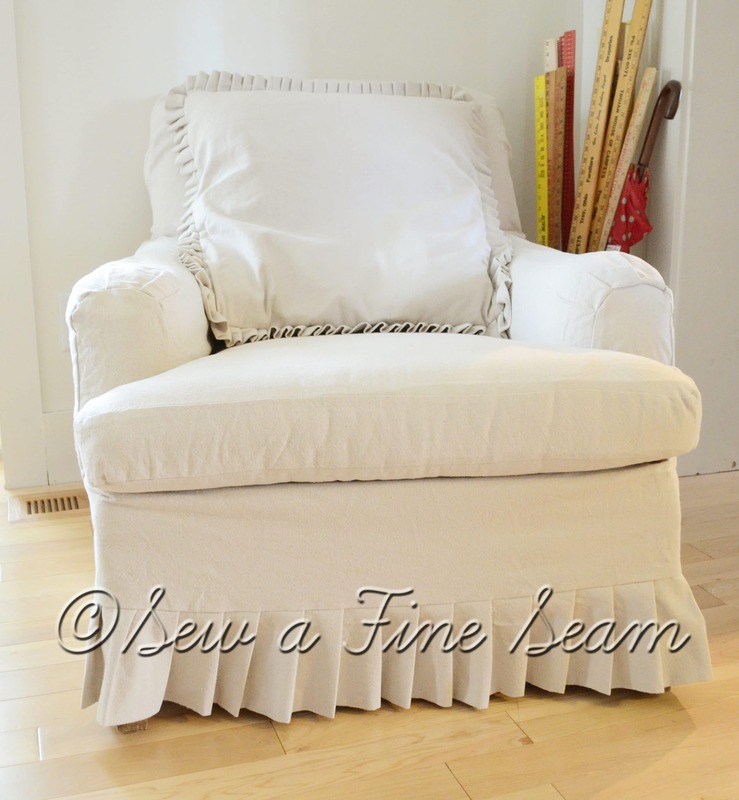 The chair ruffle and the pillow ruffle are double so there was not need for a hem. Gives a little thicker texture and neat drape. 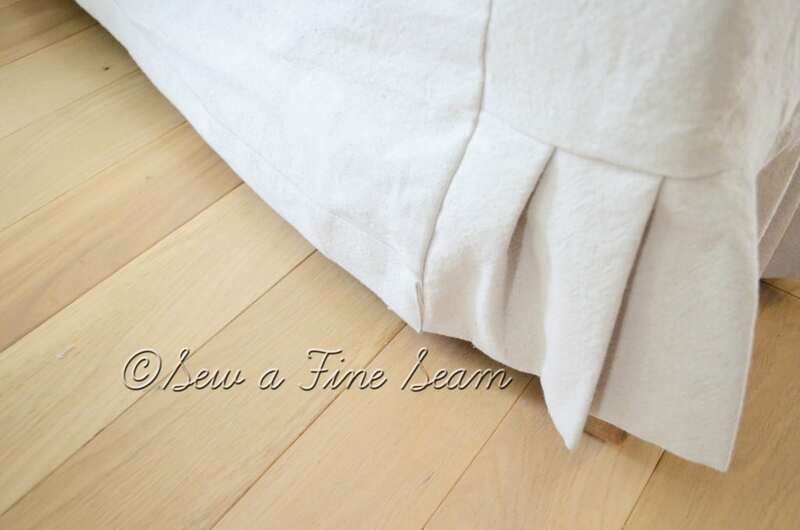 Here is the side where the pleated ruffle stops. I have used ribbon and created ties for the open sides on slip covers but this chair decided it needed a less frilly look so I sewed on velcro to keep it neat and tidily covered! 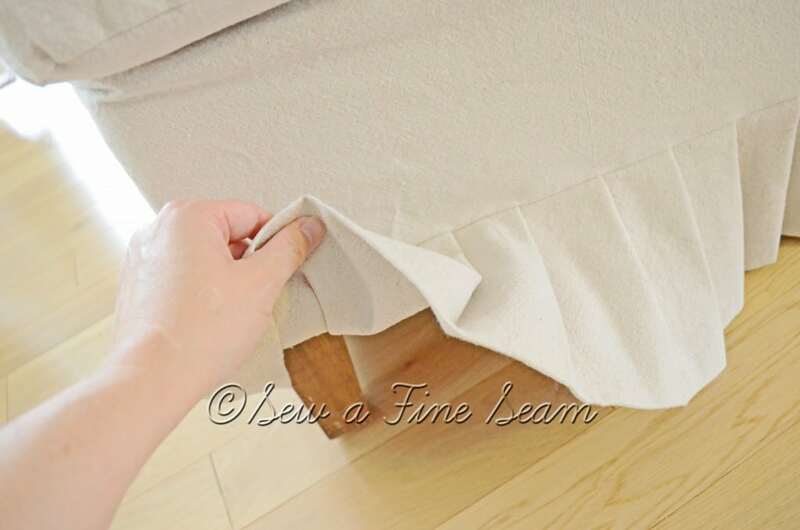 Rounded edges just get tucked and folded to fit the chair neatly. Perfect spot to browse through all the new fall magazines. I really kind of wanted to keep this chair/ottoman duo. It paired quite nicely with my collection of vintage yardsticks. It even looked great with my sticks and leaves and herbs and flowers and knots artwork! But considering that directly to the right of the chair is the kitchen door way and this was completely blocking the walkway, it really isn’t a convenient spot for a chair and ottoman. So I let the owner take them home. 🙂 And since they weren’t mine it was nice to have the project finished and out of my way. Someday I will figure out exactly what furniture I like for my living room and get some comfy stuff of my own! Do you have furniture that is looking tired? Slip Cover it! Pam that would be just the best. Wish I could fly my family out – Travis could take the girls skiing and I could slip cover stuff and chat! Awesome as always! Very good and classy work…I love seeing all the fun projects you do….thanks for sharing. 🙂 Thanks Angie! I spent today painting – chalk paint and milk paint. I’m going to get addicted to that milk paint very very quickly! I’ll try to show some pics soon! Got to get all the projects I started today finished so I have pretty ‘after’ shots for you! GORGEOUS work!! I just wanted to curl up in that beautiful chair! Thanks Susan, and yes, you would want to curl up in it – it was one of the most comfy chairs I’ve ever sat in! Love – especially the pleats! 🙂 Thanks Jenni – if your couches ever get to looking like they need some love you know who to call! I love the pleats, too. It looks so classy and so comfy. Another great job. Thanks Mom! And thanks again for taking the time to teach me to sew so many years ago! Thank you Judy – it was a very fun project – it all came together very well. Practice makes perfect I guess – each slip cover project I do goes a little bit better! Awww, thanks! I will be by to visit you soon – the little preview of your blog that popped up when I hovered over your name looks so wonderful! See you soon! Wow, wonderful job!! Oh, I have all of the desire to sew and none of the skill. Maybe someday. Thank you Tracy – if you want to I’m sure you can learn! Start with a pillow – they are so simple and go together quickly so you have a finished project without a long process getting there! 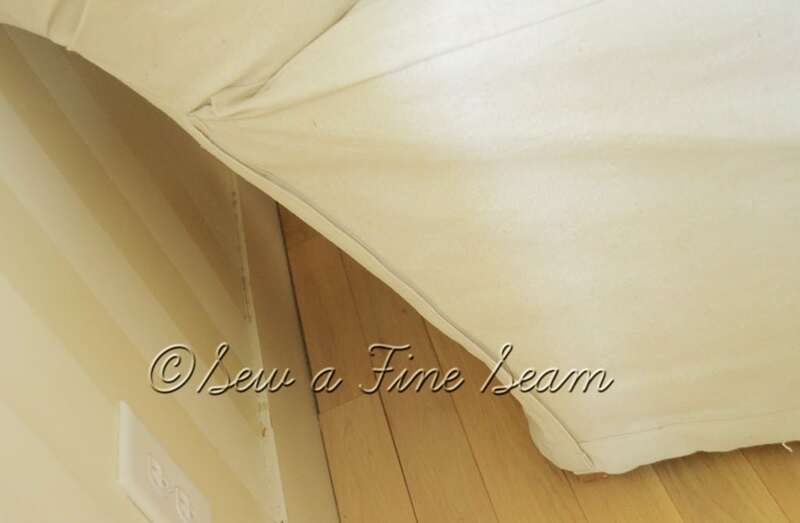 What a great job you did on that slipcover! So beautiful! 🙂 Thanks! I will be by to visit you soon – LOVE your blog name! Beautiful Chair transformation! I would love to curl up in it with a great book and a cup of coffee! Leslie, this chair was so comfy and big and just wonderful. And my client got it for $25!!! I think she said they threw the ottoman in for free! I’ve got to get out there and find me a deal like that! I am SOOOO inspired by your beautiful creativity! Seriously…the things you sew are awe inspiring. Gorgeous. Aww thanks Teresa! You made my day! I’ll be by to visit you soon! Very pretty, Jill! I really like it! You are one heck of a seamstress. Another impressive project. Your chair is beautiful. The ruffles are a great touch. Thank you Amy! I just let each project decide for me what the details should look like! this one wanted pleated ruffles! 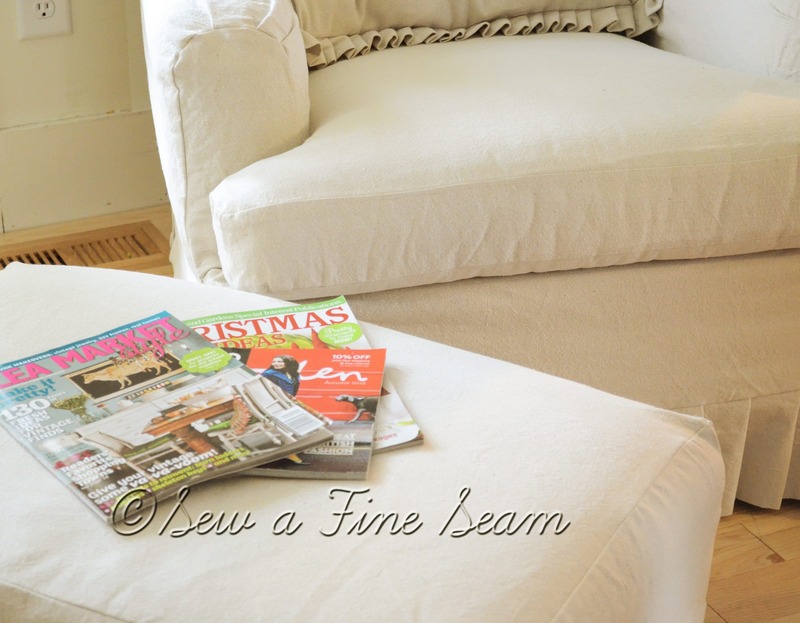 I love this chair makeover, oh how I wish I could sew. Especially ruffles. Thank you Leslie! I will be by to visit your blog soon! Thank you Vanessa – and thanks so much for all the work you guys do for the link up each week! Is it totally uncool to have darker furniture? Not that I am overly concerned with coolness at this stage of my life 🙂 Ours is falling apart and will need replaced…. I’m just hanging on, hoping to get through the toddler years! The pleated ruffles add a nice touch. I agree with some others…I could curl up with a book and a mug of something warm and steamy and spend this beautiful morning there! Rachel, it’s made out of drop cloths so yes it is VERY washable. I have had a drop clot slip cover on my couch for quite awhile now and it is amazing how stuff doesn’t show on it like you think it would. I don’t wash it very often at all. I can’t even think of more than one time I took it off and washed it and that was just because I wanted to shake all the stuff out of it and decided while it was off i’d just wash it. i know you think you can’t do it with toddlers but I’ve read several other bloggers over the years who say they HAVE done it with little kids AND dogs and they get along great! you honestly would be pleasantly surprised I think! The chair is beautiful. It made me sad though when I read that it left your home. Today is my first visit so I just figured out that you sew for others. 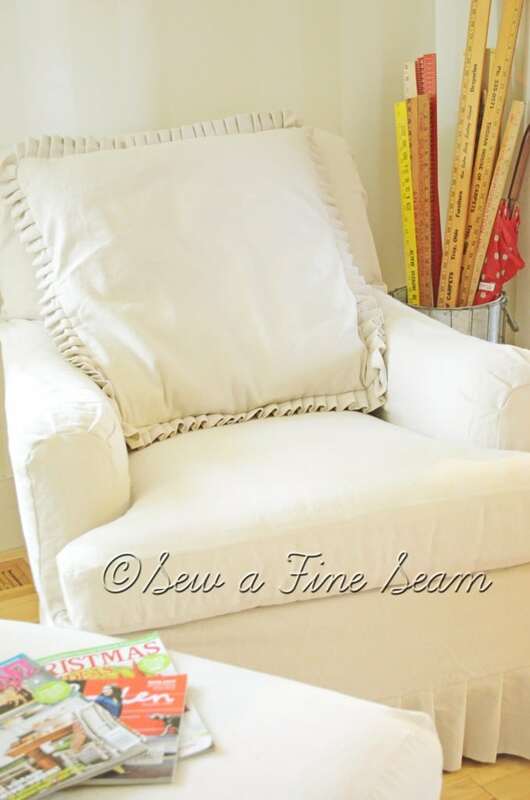 I made new slipcovers for my sofa and chair in the summer, but I don’t think I would ever do so for anyone else. Thank you Carol! It was a fun one to do – it turned out really well. I watched Miss Mustard Seed’s tutorials on slip covering a chair and that gave me the tips I needed to feel confident to do this for other people. I had done several for myself but here tutorials were better than any of the books I’d read about slip covering! If you haven’t already go check out her tutorials! Thanks for coming by and leaving a comment, I hope you will come back! Thank you Sonya! Go for it – company coming is a great incentive! And just think, it will also give you a great blog post too! Thank you Kelly! I am really pleased with how it turned out 🙂 And thanks for hosting a party! Wow beautifully done! I need to make slipcovers and you have inspired me. 🙂 Good! So glad I could inspire you. It really is so easy when you follow Miss Mustard Seed’s videos! Oh Jennifer I wish I could do it for you – where do you live? Thank you Kathryn! And thanks once again for hosting and for taking the time to come over and leave a comment – it means a LOT! Jill what a beautiful job! I’m featuring you later tonight on Totally Transformed Tuesday. Thanks for linking up. Oh Peggy, thanks so much! It’s so fun to be featured on great blogs that host linky parties 🙂 I’ll be back! Beautiful. I love the ruffle. I’m visiting from Air Your Laundry and I’m so happy I stopped by. 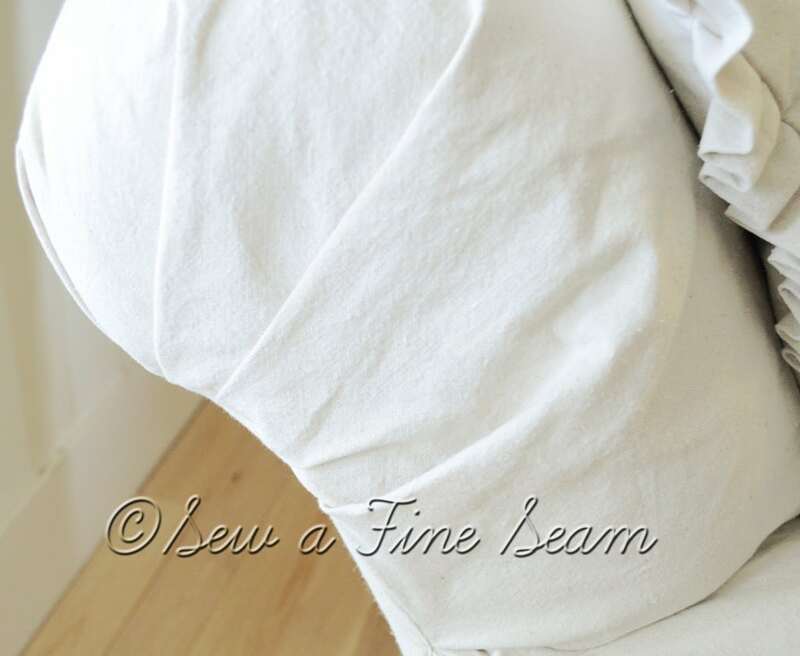 I’m in a big sewing mood and couldn’t be happier to have found your beautiful blog. Thanks Robin! The chair was fun to do – it turned out really well which makes it much more fun of course! Thanks so much for your sweet comment about my blog – I’ll be over to see yours too! Great job on this! 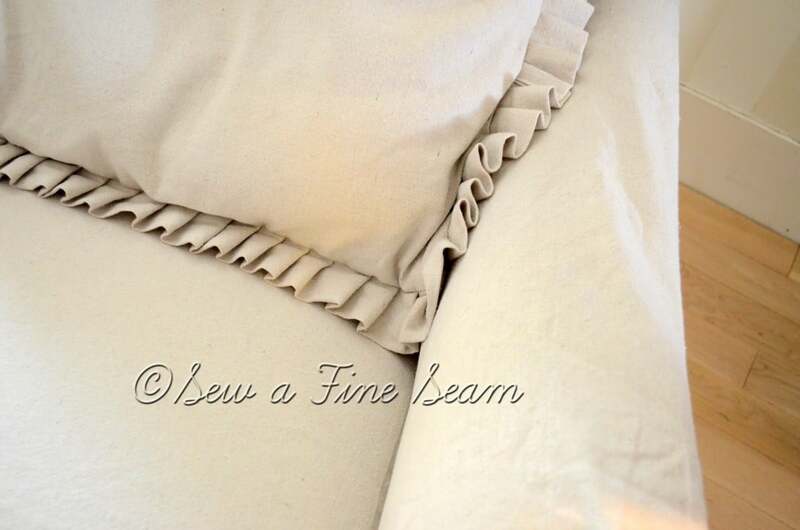 I am way impressed with your pleated ruffles…especially the pillow. Happy Weekend Jill! Aww thanks Ann – coming from you that is high praise! Your pillows are among the best! That turned out beautifully, Jill! For a second, I thought you got to keep it. Isn’t it funny how we always do the fancy stuff for others, but never seem to get around to our own pretties? All in good time. Lovely work. 🙂 Thanks Jami! I wish I could have kept it! Someday I will get my own furniture figured out and have some beautiful finished pieces for myself!